Be sure you have an ORCA card and some extra patience. That’s the message for downtown bus riders from local transportation officials as the region counts down to March 23, the day hundreds of buses will no longer travel through the downtown transit tunnel. Instead of traveling beneath downtown, 830 bus trips each weekday will shift to already congested surface streets. Some other routes, meanwhile, will see changes in stop locations or increased frequency to try to keep things moving. The upshot: If you take a bus that today travels through the tunnel, your ride might take longer than you’re used to. And if you regularly rely on a stop downtown — even if it’s not in the tunnel — you should check to make sure it hasn’t changed. On the heels of the three-week Highway 99 closure, the transit changes will further squeeze Seattle’s fast-growing core. “We are building right now the transportation infrastructure for the city that we’ve already become,” said Heather Marx, director of downtown mobility for the Seattle Department of Transportation (SDOT). Removing buses from the tunnel will make room for the expansion of the downtown convention center and for more trains running on new light-rail lines expected to open in the coming years. Trains and buses now share the tunnel, which can limit and slow down trains. Moving buses to surface streets could help trains run with more reliable frequencies, about every six minutes, Rogoff said. Some buses moved out of the tunnel serve North Seattle or the Eastside, areas that will, in several years, be served by light rail. About 37,000 riders now board and de-board buses in the tunnel each day, according to King County Metro. Buses that now use the tunnel will shift to downtown streets, slowing some trips and adding more buses and passengers to the surface. Some downtown routes that already use surface streets, meanwhile, will be shifted to new bus lanes on Fifth and Sixth avenues downtown, which could make those routes faster, Metro’s service-development director Bill Bryant said Wednesday. 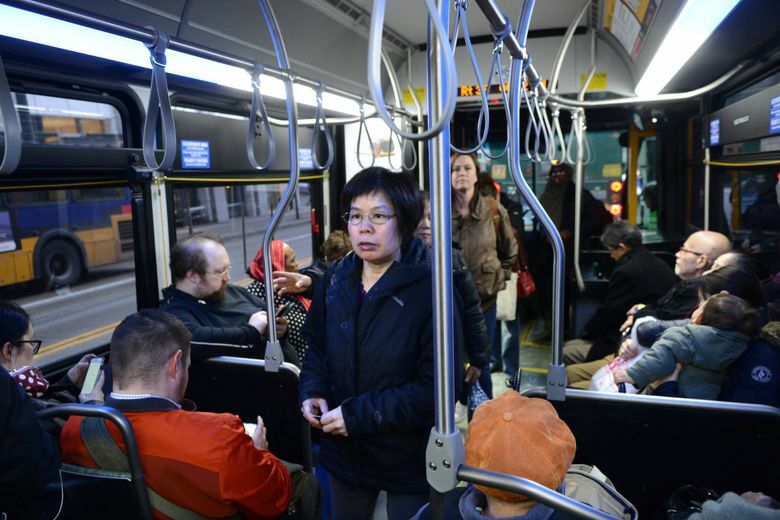 In an ongoing effort to respond to bus overcrowding, Metro will increase trips on several heavily used routes, including Route 40 to Ballard and Fremont, 102 to Fairwood near Renton and 120 to Burien. Seven Metro and Sound Transit bus routes that now use the tunnel will travel on Second, Third, Fourth, Fifth and Sixth avenues. Officials urged bus riders who rely on routes that go through the tunnel to be patient. All riders who depend on downtown stops should check Metro’s website to ensure they know where their stop will be located, they said. Riders can find information about all routes affected by the changes on King County Metro’s website. Bus riders should also have ORCA fare cards if they can, rather than attempting to pay with cash, to speed up transit service for all riders, Metro representatives said. For all routes that travel along Third Avenue between Jackson Street and Denny Way and along part of Westlake Avenue through South Lake Union, Metro soon will allow all-door boarding. That means passengers tap their ORCA card on sidewalk kiosks and then get on the bus through the front or back doors. All-door boarding is meant to reduce the wait to get on the bus and keep buses moving faster. It could increase bus capacity of Third Avenue by up to 30 buses per hour, Bryant said. Riders paying with cash can still enter through the front door. ORCA cards can be purchased online, by mail or in person at certain locations. People with low incomes can apply for an ORCA Lift card and discounted fares. Of 30 stops downtown where all-door boarding will soon be in use, 21 already have the ORCA kiosks. But the remaining nine stops don’t yet have the machines, so Metro employees will stand at the stops from 3:30 to 6:30 p.m. each weekday with handheld card-readers until that equipment is installed. All 30 stops are expected to have the card readers by the end of the year. Metro will deploy more fare-enforcement officers with an initial focus on education rather than ticketing, Bryant said, though he could not say how many additional officers would be inspecting fares. An audit released last year found Metro’s fare enforcement particularly affects people experiencing homelessness, and the agency shifted its enforcement from a criminal to civil process, Bryant said. Sound Transit has not yet made the same shift. Text and email alerts, as well as signs at bus stops, will notify riders about the changes downtown. The city and county plan to share data with apps like Google, Waze and One Bus Away in hopes they will show updated information. Sign up for alerts on King County Metro’s website or call 206-553-3000 for help.